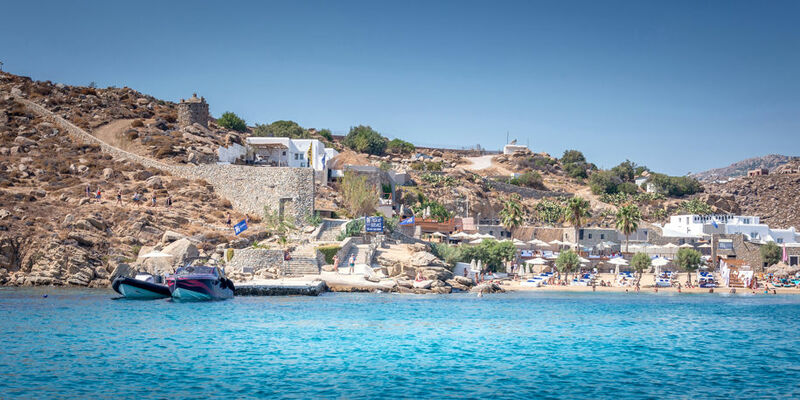 In March 2017, Human Point Architecture Construction & Development was appointed the architectural study and new business development of Paradise Club in Mykonos island considering the need of a radical reassessment of spaces for optimum functionality and services. During the past decades, Paradise Club shared an internationally acknowledged success operating mainly as a night club in a semi-open space, hosting some indoor functions as well. At that time, the building was situated literally on the beach and the main entrance of the club was through the neighbouring hotel premises. 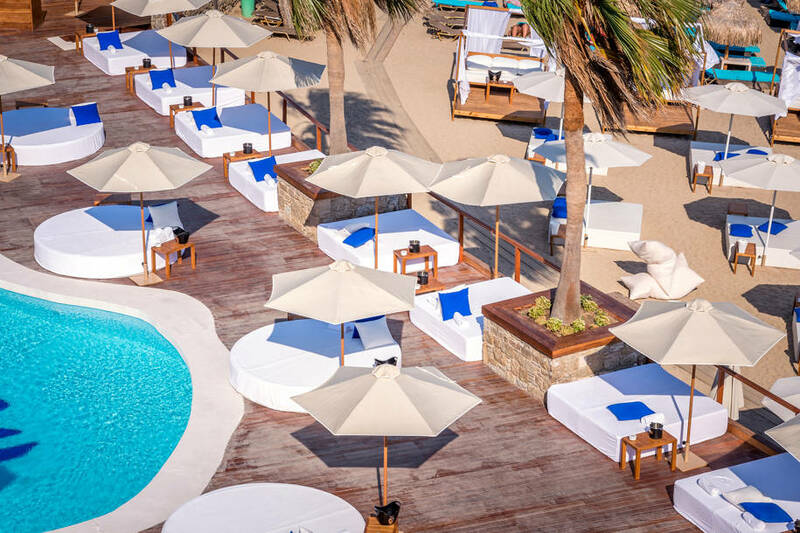 The redefinition of its operation came from the desire of the entrepreneurs to create an outdoor space that could run as an all-day club, offering premium F&B and entertainment services. The club could also operate at night on predetermined dates, hosting special music events with guest artists of international reputation. 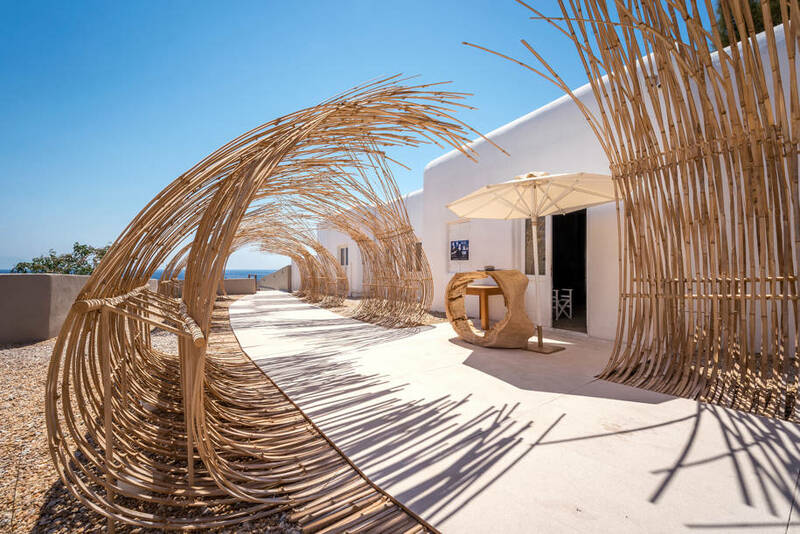 The proposal was to create a new space totally integrated within the extremely beautiful natural environment, yet, with references from contemporary organic art elements, as well as, traditional construction materials. Overall, the aim was to generate the sense of a new experience within the particular morphological surroundings of the area. The existing club included a 400 sq.m. building on a 2.000 sq.m. plot. 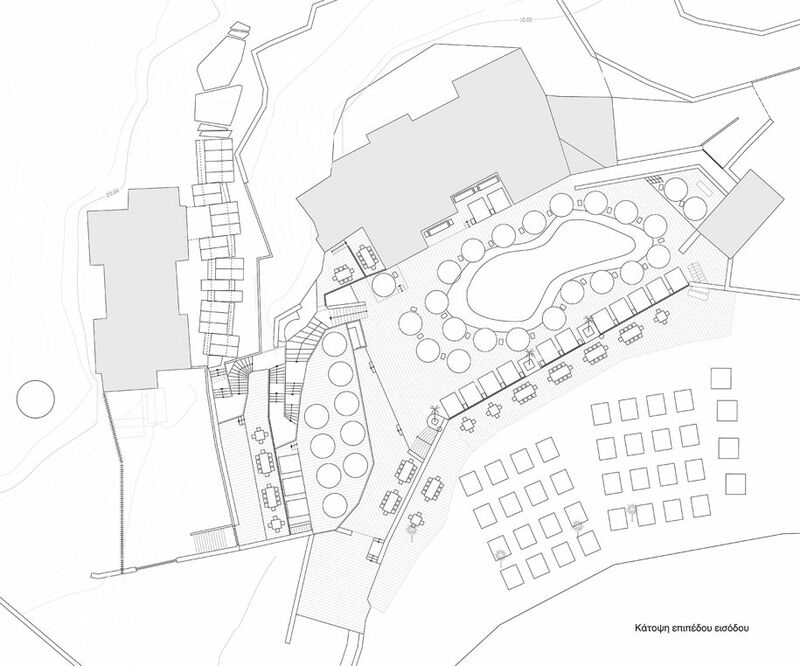 In order for the exterior and interior spaces to open up and to obtain a separate and distinct entrance from the surrounding hotel premises, two lateral properties of 4.000 sq.m. were ceded. 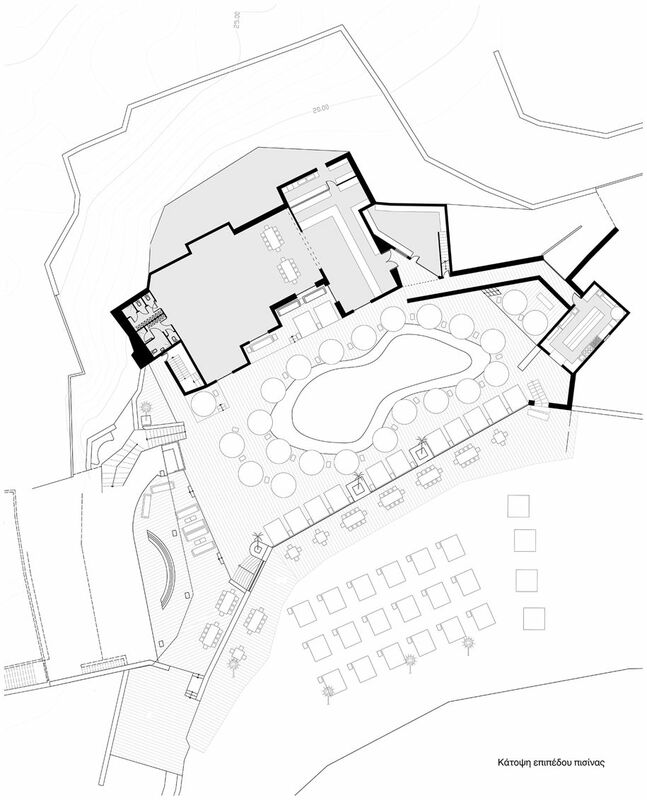 The project also embodied 700 sq.m. of beach front. The new entrance – literally opposite the pre-existing one and with a separate access point from the main road – is situated on the highest level of the property. 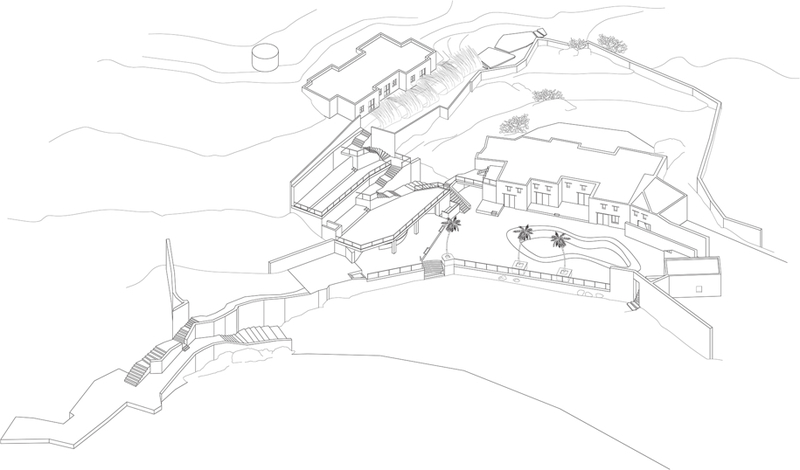 A descending path to the club is created, with various intermediate levels operating as premium “common areas” and leading all the way down to the beach. 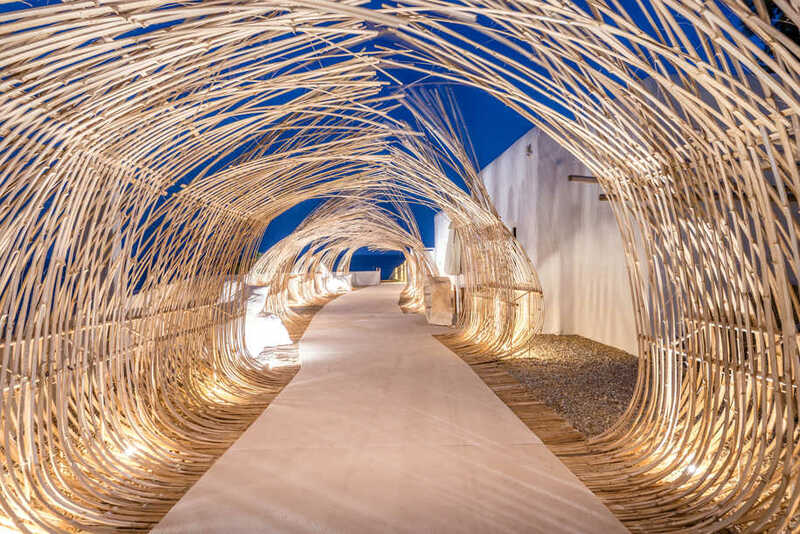 The concept of the entrance design is an organic installation structured by 5 meter tall bamboo beams grasped on the ground, with a curvilinear shape formulating a natural tunnel. 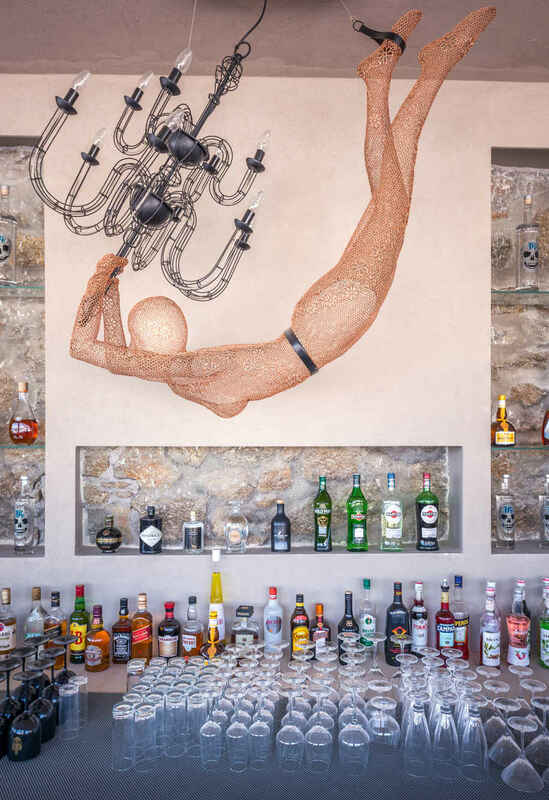 The design is finalised under an artistic scenery perspective, with the insertion of abstract human sculptures inspired by Cycladic figurines. 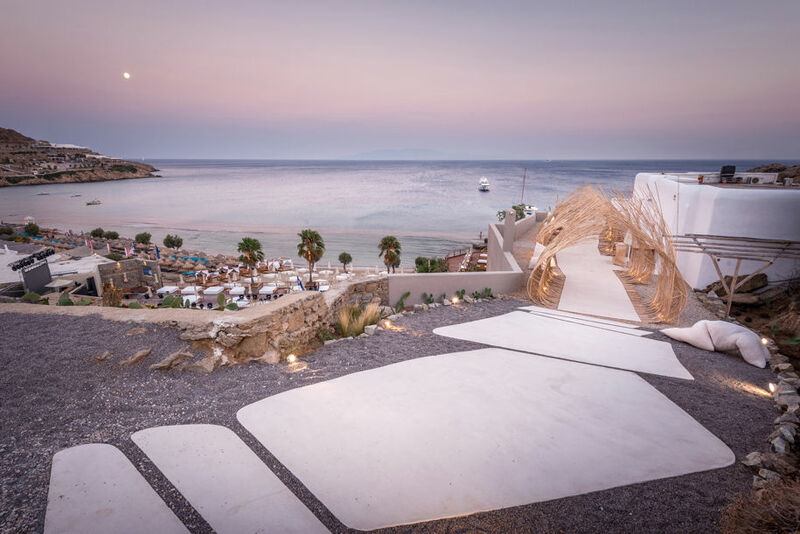 For the floor, a mixture of concrete and sand was applied creating a natural “carpet” that extends from the highest entrance level, through the main staircase and all the way down to the lowest pool level. 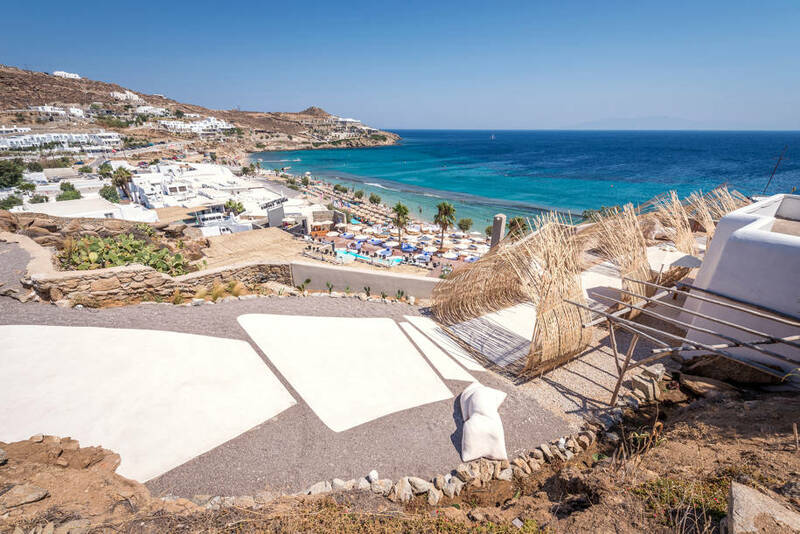 The multi level “common areas” were designed with reference to the Cycladic morphological element of a flowerbed, “parteri”. They serve as semi-private terraces for gatherings and parties, but also as relaxing stations while descending the main staircase. The floor is covered with a natural, minimal, wood coat creating a discreet gateway to the sea view. 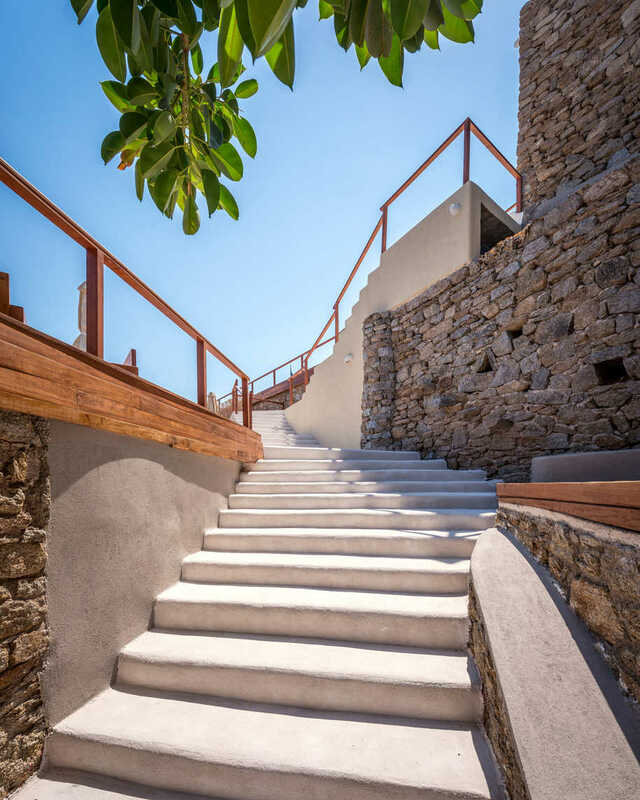 Special emphasis was placed on the sculptural design of the staircase that connects all levels, with reference to local morphological features, such as, large irregular stairs. 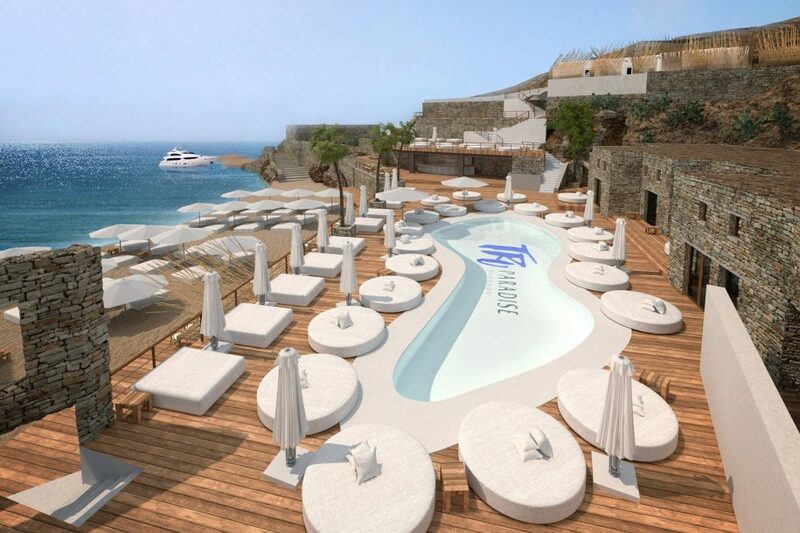 The pool level, which rises 1,5 m. from the beach level, consists of the pool and its surrounding space, designed as a gathering area for drinks and fun, as well as part of the restaurant area. On the same level, indoor and outdoor spaces for the preparation of drinks and food were reconstructed or refurbished. Special attention was given to the study of the preparation room and to the main sheltered bar to resemble an unusual interior design frame. 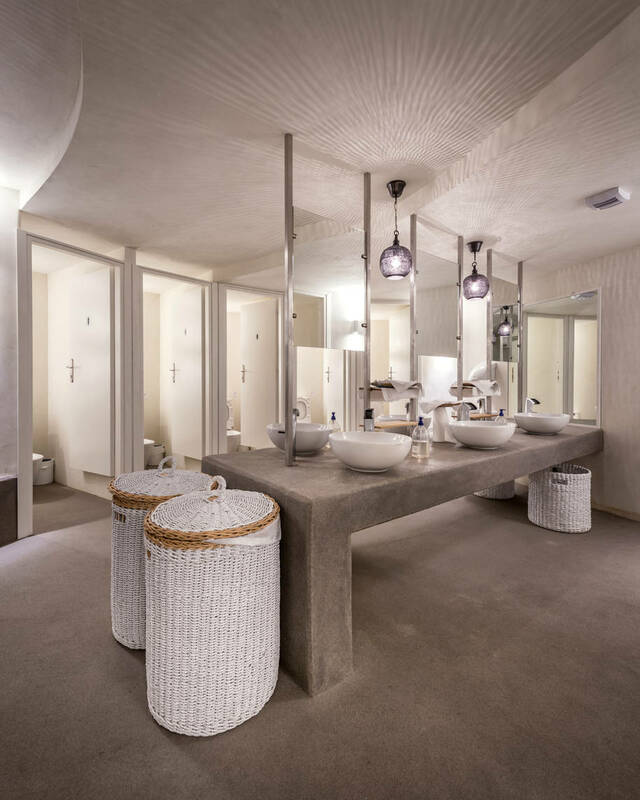 At the basement level, the guest toilets were placed and redesigned following a minimal and curvilinear synthesis, aligned with the overall aesthetics. Emphasis was also placed on the creation and set up of the DJ stage section, considering the acoustic prescriptions ordered by space geometry and dimensions. 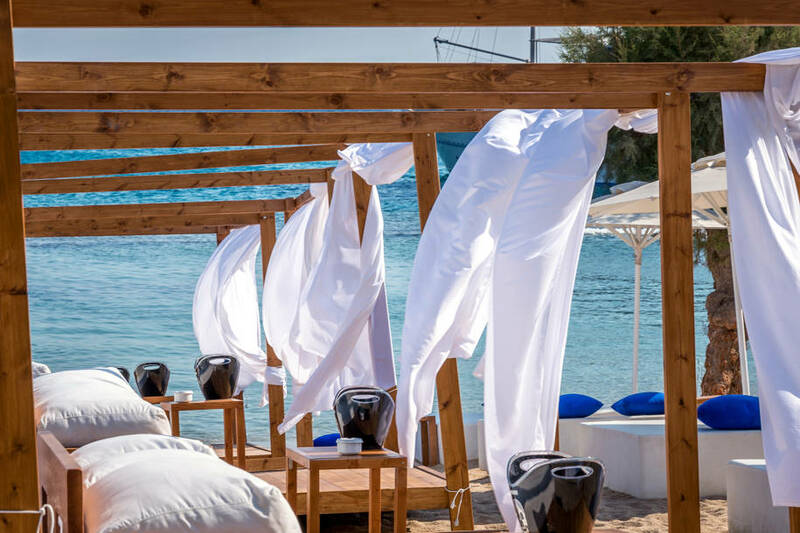 Finally, some mobile, wooden installations and equipment were placed on the beach for guests to relax, sunbathe and enjoy the sea. Part of the designed amenities of the club was the study of a floating platform for yachts and watercrafts. Throughout the project, natural construction materials were used such as stone, bamboo, wood, concrete & sand mixture and organic plaster. The furniture is tailor-made, made of wood with cushions of white organic fabric. 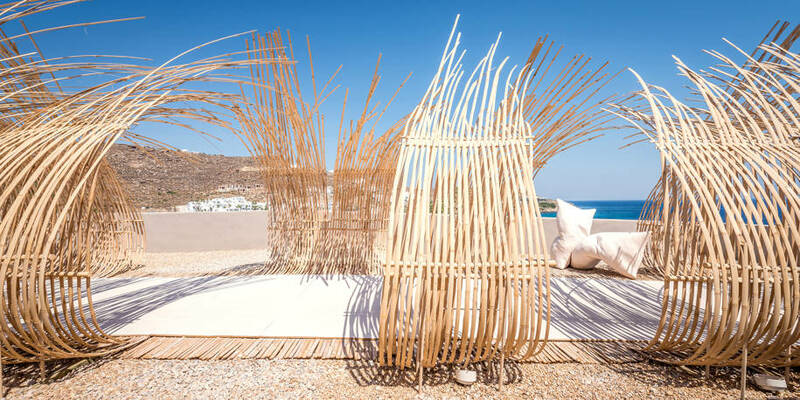 Check out the renovation of Ostraco Suites in Mykonos by Stella Andronikou!